You may recognize this chorus from the folk song, “Big Rock Candy Mountain,” attributed to Harry “Haywire Mac” McClintock and made famous in a 1950s recording by Burl Ives. 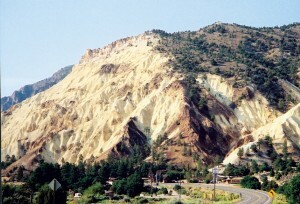 Located a few miles north of Marysvale in Piute County, Big Rock Candy Mountain consists of altered volcanic rock in various shades of yellow, orange, red, and white. Approximately 22 to 35 million years ago, a cluster of stratovolcanoes (volcanoes similar to Mount St. Helens) erupted, depositing large volumes of lava and ash. Known as the Bullion Canyon Volcanics, these volcanic rocks are more than 3,000 feet thick. Approximately 21 million years ago, at least six magma bodies intruded the overlying Bullion Canyon Volcanics. Through a complex chemical process involving hydrogen sulfide, steam, ground water, and oxygen, the original volcanic rock was partially altered or totally replaced. 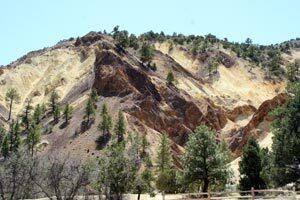 The vivid colors that one sees at Big Rock Candy Mountain are the direct result of this mineralization. The yellow, orange, and red colors are from the presence of iron minerals, such as jarosite, hematite, and pyrite. The white color is due to the presence of alunite and kaolinite, minerals rich in potassium. Over the past 15 million years, erosion has removed the distinct shapes of the former volcanoes, and within the past several million years has exposed the altered volcanic rocks in Marysvale Canyon along the Sevier River. From Salt Lake City, travel south on I- 15 to I-70 (exit 132). Turn left (east) onto I-70 and travel 22.4 miles to exit 23. Turn right (south) onto U.S. Highway 89 for 7.6 miles to view Big Rock Candy Mountain from a distance. If you want a closer view, travel an additional 0.6 miles to the Big Rock Candy Mountain Resort. Please respect private property when at the resort. Glad You Asked: What Causes the Foam on Great Salt Lake?